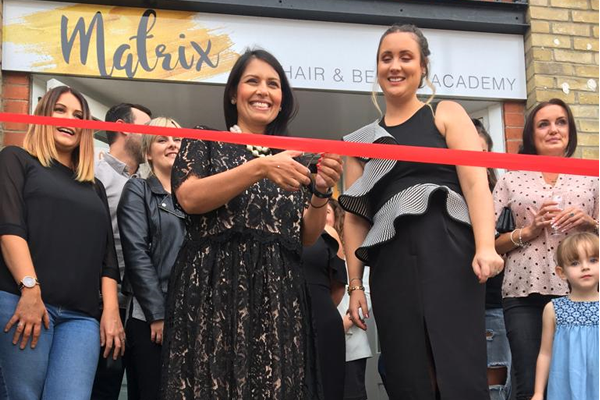 Witham MP, Priti Patel, cut the ribbon at the opening of a new beauty academy in Colchester yesterday evening [Thursday 30 August 2018]. Matrix Hair and Beauty Academy, based at Hythe Quay in Colchester, offers a number of private and Government funded beauty courses for those looking to start a new career as well as existing beauty therapists. The academy also offers a number of beauty treatments from facials to spray tans. “I am delighted to be here to officially open Matrix Hair and Beauty Academy. It is a fantastic business and the varied range of courses will help people to build a new career or develop existing skills, boosting employment in the area.